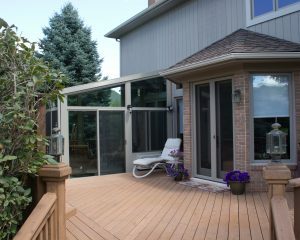 SRA Home Products proudly installs outdoor rooms for homeowners in the Marlton, New Jersey, area. This is the perfect opportunity for local residents to expand their homes’ living space by installing a sunroom or screen room for a fraction of the cost of constructing a traditional home addition. All of our outdoor rooms offer unique features that place them ahead of the competition and make them the best choice for your home. Both our sunrooms and our screen rooms include innovative thermal roofs that deflect the sun’s rays, helping to keep you cool below. Additionally, our sunrooms feature high-performance glass with SPF 59 or SPF 85, and our screen rooms feature removeable vinyl sashes that block out up to 99 percent of the sun’s harmful UV rays. One of the most impressive features of our outdoor rooms is our screen rooms’ ability to easily convert to sunrooms, should the need arise in the future. If you initially opt to install a screen room, then decide later on that you would prefer the benefits of a sunroom, we can upgrade the vinyl sashes on your screens to state-of-the-art HPG 2000 glass. If you’re interested in learning more about the innovative outdoor rooms installed by SRA Home Products in the Marlton, NJ, area, please call us today. We look forward to helping you maximize your home’s potential living space.